I decided to try a different apple in our pie this Thanksgiving. I used “Honey Crisp” apples and the pie was a perfect blend of sweetness and tart. I had fun with the topping making apple peel roses and pie crust leaves from the leftovers, then filling in the empty spaces with crumble. Next time I’ll try to be a little more artsy-fartsy with it. You can use whatever topping you prefer. Many pie crust recipes call for either butter or shortening. I like to use both because I like to think it gives me the best of both taste and workability. This is my no-fail pie crust recipe. 1. Combine flour and salt in a large mixing bowl. Cut in butter until you have a coarse crumb mixture. Add ice water a tablespoon at a time until mixture forms a ball. 2. Wrap and refrigerate for a minimum of 2 hours. You may also make this ahead of time and refrigerate to use within the week. Otherwise, store in freezer in a freezer safe bag. 3. Roll out dough to fit a 9-10 inch pie plate. With the aid of your rolling pin, gently drape crust over pin and center over pie plate. Once placed, press evenly into the bottom and sides then pierce bottom of crust all over with a fork. Reserve leftover dough for open work crust. Be creative! 8-10 Honey Crisp Apples (Peeled, Cored, & Sliced) If you want to make roses from the apple peels, do your best to peel apples keeping the peel intact as one piece and set aside for later. 1. Preheat oven to 425 degrees F. Add spices to sliced apples and toss until all are evenly coated. 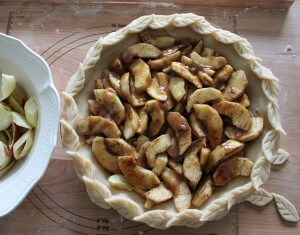 Fill pie crust with apples, set aside. 2. Melt butter in a saucepan. Stir in flour to form a paste. Add brown sugar and white sugar, bring to a simmer, stirring mixture until sugars are just dissolved. Gently pour the mixture over apples. Cover with an open work crust. For rose peel topping, gently wind each peel around finger and lightly adjust once placed. Apple filling ready for topping. 3. Bake 15 minutes in the preheated oven. Reduce the temperature to 350 degrees F. Continue baking for 35 to 45 minutes, or until apples are desired texture. Remove from oven and let rest for 15 minutes before serving. Many pie crust recipes call for either butter or shortening. I like to use both because I like to think it gives me the best of both taste, texture, and workability. This is my no-fail pie crust recipe. Combine flour and salt in a large mixing bowl. Cut in butter until you have a coarse crumb mixture. Add ice water a tablespoon at a time until mixture forms a ball. Wrap and refrigerate for a minimum of 2 hours. You may also make this ahead of time and refrigerate to use within the week. Otherwise, store in freezer in a freezer safe bag. Roll out dough to fit a 9-10 inch pie plate. 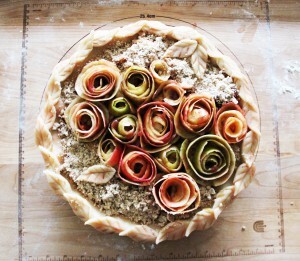 With the aid of your rolling pin, gently drape crust over pin and center over pie plate. Once placed, press evenly into the bottom and sides then pierce bottom of crust all over with a fork. Reserve leftover dough for open work crust. Be creative! Preheat oven to 425 degrees F. Add spices to sliced apples and toss until all are evenly coated. Fill pie crust with apples, set aside. Melt butter in a saucepan. Stir in flour to form a paste. Add brown sugar and white sugar, bring to a simmer, stirring mixture until sugars are just dissolved. Gently pour the mixture over apples. Cover with an open work crust. For rose peel topping, gently wind each peel around finger and lightly adjust once placed. Bake 15 minutes in the preheated oven. Reduce the temperature to 350 degrees F. Continue baking for 35 to 45 minutes, or until apples are desired texture. It’s not Turkey Day without pumpkin pie! I used the recipe from Home is Where the Boat Is. I used my pie crust I shared above. I just doubled the recipe so I had enough for both pies and it worked out really well. The kids had enough leftover dough to play with and bake. 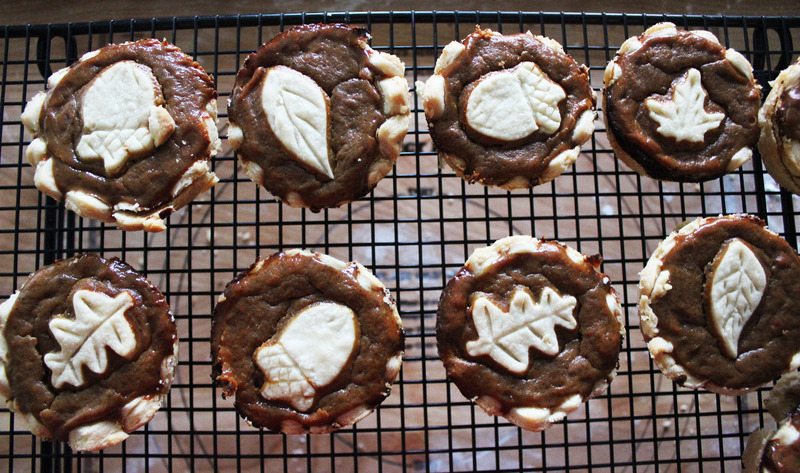 The mini pies turned out great. The recipe was a quick mix and it is pretty much no fail. I was out of my pre-mixed pumpkin pie spice so I added my own. My eldest son did let me know he thought I added a little too much spice and I had to agree. It wasn’t the recipe it was my heavy hand so we added a little more whipped cream to the top and it cut the taste. These are adorable and they were a hit with the kids as well. 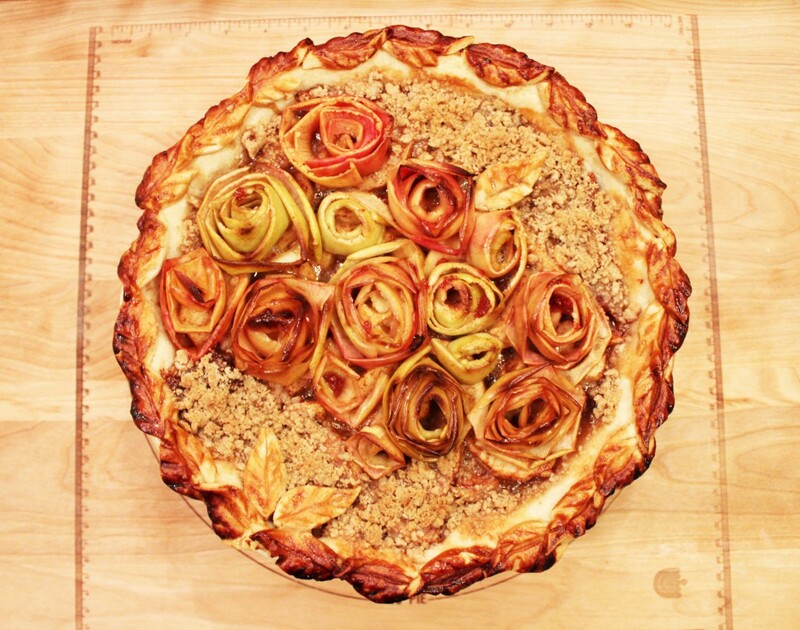 This entry was posted in Kitchen and tagged Apple, Baking, Perfect Pie Crust, Pie on November 28, 2013 by Rosa.